I'm a bit odd when it comes to sleep patterns. Fighting off sleep isn't something that I'm good at. Sure, the usual suspect of coffee can be employed to kick start things for a little while, but as a rule when my body wants to sleep, if there isn't some pressing reason for me to be awake, I let sleep happen. The downside of this is that I won't feel tired when I should be asleep - this morning as I write this, for example, I woke up about half 2 in the morning, after falling asleep at about eight in the evening. I know that as a result I'll probably be ultra-tired when it gets to this evening, but I'll desperately be trying to keep awake in order to try to get my sleep pattern back into some kind of order. The thing is, I quite like being awake in the middle of the night. I'm not a night owl - I'm much more of a morning person - but waking and getting up early is quite nice. I'm generally most creative when I first wake up (useful for blogging) and when the rest of the house is still sleeping you're able to do all those things that you'd like to do, such as watching several episodes of House or spending an hour looking at a website on train journeys. I remember reading something about how the brain handles memories - apparently it basically takes everything in, and somehow packs it so that all the stuff that happens every day, the non-noteworthy stuff, sort of merges together, whilst the unusual stuff stands out more. That's why you can often recall a holiday from years ago day-by-day, while what you had for lunch on a certain day last week is difficult to recall. There was a point to all this... but, ironically, I've forgotten! I consider myself a night person. My sleep pattern has been strange lately too, and I've been waking up in the middle of the night or early morning while it's still dark out, remembering an odd dream, but then going back to sleep. 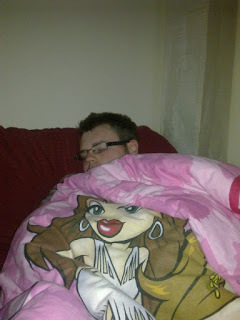 Adorable photo of you and the pink blanket. Do you have daughters?